The 12.3-megapixel camera is also said to be the quickest one the company has tested. Google has revealed the specs for its new Pixel smartphone's 12.3-megapixel rear camera and they're pretty impressive. For starters, its 89 score from DXOMark makes it the "best smartphone camera" ever, the company says, and brings it close to a dedicated compact camera in terms of sharpness and color accuracy. The relatively large sensor and smallish megapixel count yields a big 1.55-micron pixel size, meaning the camera will be good in low light too. It has the shortest capture time of any smartphone Google has ever tested, meaning there's next to no shutter lag when you're taking action shots. With that speed, the HDR function is always on, improving overly-bright daylight scenes and shadows that are too dark. Google says it splits images into short, multiple exposures in order to align pixels, eliminate blur and improve dynamic range. Needling Apple, the company added that it does all that without a camera hump. Once the images are captured, the smartphone can process them twice as fast as previous models, thanks to the fast Snapdragon 821 chip and 4GB of RAM. Google hasn't forgotten about video either. 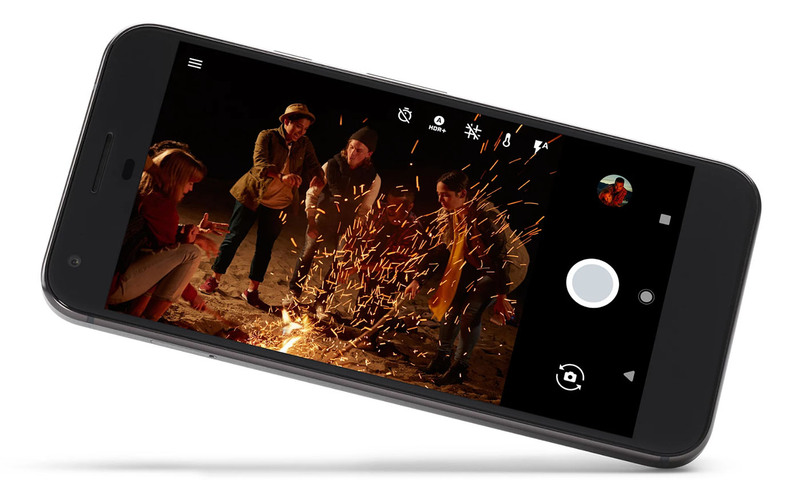 The Pixel can capture 4K video at 30 frames per second, 1080p video at 120 fps and 720p at 240 fps. The company showed an impressive video stabilization demo of someone walking (jerkily) down the street, with stabilization turned on and off. Suffice to say, the stabilized version was quite smooth, while the un-stabilized footage was basically unusable. Google said the camera samples the gyroscope 200 times per second, instantly compensating for shaking and rolling shutter, also known as the jello effect. One can't help but compare Google's Pixel smartphone camera to the ones on the iPhone 7 and 7 Plus. In sum, the Pixel lacks the iPhone 7 Plus's telephoto lens and future depth-of-field "bokeh" capacity, but is faster and has better optics, if the DXOMark score is any indication. However, both iPhone 7 models pack faster f/1.8 rear lenses than the f/2.0 glass on the Pixel. We'll need to get our hands on the Pixel to confirm if it's as good as Google says, of course. Being native Google devices, Pixel smartphones will have Google Photos built in, making it easier to back up and search for photos. Both the 5-inch Pixel and 5.5-inch Pixel XL go up for pre-order starting today, and will arrive to the US at Verizon first.